This is a follow up article of two previously published articles on the National Fatherhood blog! Research now finds that 1 in 4 new dads become depressed after the birth of their child. Becoming a father is every bit as stressful and life changing as becoming a new mother. There are the sudden changes in social lives, private lives, family relationships just to mention a few. There are stressors placed on careers, finances and time when becoming a parent. The major differences between becoming a new mother and a new father is that women most often were conditioned and coached from childhood to be with babies and children while many fathers were not. Then when their first child comes along they are suddenly expected to cope and support the mothers of their babies. Men who have been conditioned to "fix" everything are suddenly faced with a new born infant. A living human being incapable of speaking words. Interpretation and instructions are required. Would you be surprised to learn that when their baby is born men too experience changes in their hormone levels. Their testosterone drops and their estrogen rises. Studies have shown that when fathers spend more time caring for their infants their bodies also produce oxytocin! Oxytocin is the bonding hormone, it is what makes us feel all warm and fuzzy around our baby and why we smell our babies. Men do indeed suffer from depression and the symptoms are different and they come on further after the baby is born. When we consider that 90% of fathers are involved at the time of the babies' birth but this involvement drops to less than 50% by the time their child enters school we need to be concerned about how to support fathers in their new fathering role. How can we support fathers after the birth of their baby to prevent post partum depression? We can begin before the baby is born. Fathers who are attending the medical appointments, the birth classes and any other event that involves the mother and baby can be included into the conversation with appropriate eye contact and acknowledgement of his presence. Include fathers in the dialogue about their baby's welfare. Fathers worry about their baby's well-being too (Keller & Rehm, 2015). Fathers need this additional support from professionals involved with the mother and the baby because the father is a part of this ecological family unit! Is this a systemic issue? We spent nearly one hundred years studying mothers and babies and formulating the attachment and bonding theories. All of this research, 1920 Hammett and rats, 1930s Harlow and monkeys, 1940s-60s Ainsworth and Bowlby humans, were conducted with mothers and babies. Not once were fathers included as an important impact in the lives of their babies. During my doctoral research on infant massage, I asked the question, can fathers benefit from massaging their babies? Fathers did indeed benefit from learning to massage their babies and continued to massage their babies. 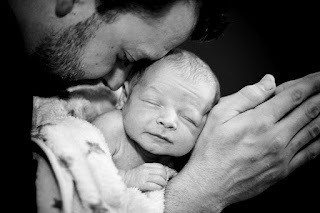 Fathers stated they felt more competent and confident in caring for their new babies. Confidence and competency are both noted in the research as complimentary factors of better parenting skills and self esteem. All of which make us feel better about ourselves. Finally, research on Infant Massage and mothers found that when mothers who reported depression symptoms watched their babies being massaged or massaged their babies, they reported less symptoms of depression afterward. It only stands to reason that this study requires replication on fathers to determine if the same results are possible. What if massaging their baby decreased their symptoms of depression and the mothers too. Massaging the baby can also make the baby sleep longer and be healthier. Both are positives for the parents. Instead of sad dads and moms maybe the family as a unit could greatly benefit from Infant Massage as one strategy of depression prevention. First time fathers, fathers in the military facing separation from their baby, fathers who are divorced or separated, fathers who are incarcerated from non-violent offenses and fathers who are step fathers, father who have adopted and grandfathers too.